Contrary to some student's thoughts, TRL's Hannah D'Iorio talks about how she thinks her education is worth the price. I walked into my classroom and took a seat next to a group of people who were too busy in their conversation to notice that someone was eavesdropping. “I wish I went to Allen,” one said. “Yeah, why would anyone want to go to Lovejoy?” another replied. Confusion immediately blocked my thoughts and hit me like a truck; I tried to process all the possible reasons to why someone wouldn’t want to go to Lovejoy. My parents pay costly tuition for me to be able to go to this school. I guess if you don’t view Lovejoy as your safe place like I do, you wouldn’t be able to understand why someone would voluntarily go here. You wouldn’t show up being grateful to be here at a Lovejoy school. The feeling is still fresh in my mind. Fifth-grade me, walking on the sidewalk, waving goodbye to my father and mentally begging him not to make me go to school. I had already verbally begged my parents that morning. Opening one of the entrance doors and immediately feeling a rush of air hit my face calmed my nerves, but not enough for me to forget all the problems that I would be facing there. I walked up the stairs to get to class, all the while wondering if anyone would decide to talk to me that day. Would anyone even look at me? Being an 11-year-old girl and showing up to school, not knowing if there would be anyone in your corner that day, is a terrifying thing. Most students at Lovejoy are going here because they live in the district, and they don’t have a choice for where to go to school. I could stay in the same school district or have my parents transfer me into Lovejoy by tuition. The feeling is still fresh in my mind. Sixth-grade me, walking on the sidewalk, waving goodbye to my mother with a smile beaming across my face. I was walking up to Sloan Creek Intermediate School. It was a different feeling than before. The nerves were there, but the dread of being at school wasn’t. The anxiety of facing the people that never made me feel like I belonged wasn’t present. People often ask why I chose to go to Lovejoy schools, and whether or not it is actually my choice. Because why would anyone voluntarily go here? The complete story behind why I wanted to move is too complex and, for some people, too dramatic for answering such a simple question. “My parents are making me,” is just my easy way of getting out of a long, deep conversation and save the clueless questioner. But the truth is, Lovejoy makes me feel safe compared to my old school. The people here are different in the way where they accept others without judgment. I don’t feel like I’m on the outside looking through a window, trying desperately to be a part of people’s lives just to end up being brushed away to the side. 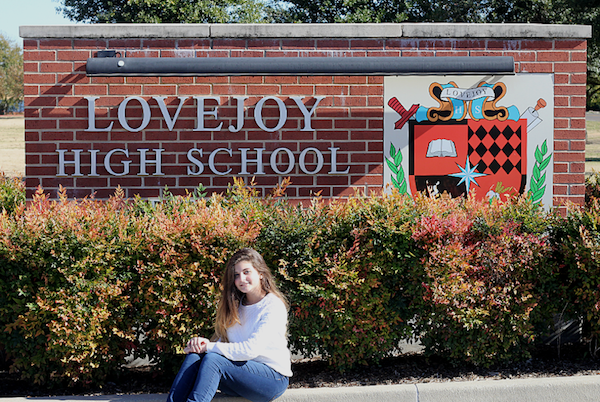 Sure, not everything is perfect in Lovejoy, but does a perfect school even exist? I was willing to overlook any flaws of Lovejoy and people here because it gave me the place to start a new beginning and help cope with my anxiety disorder. It surrounded me with people who make me feel comforted, not people who give me more reasons to be anxious. I don’t know if I would be the same person if I didn’t switch schools. Would I be a school and competitive cheerleader? Would I have joined the journalism class in seventh grade? Would I have found a way to cope with my anxiety? Or would I be dealing with more mental health issues? As one of the original faculty members, it makes me feel like we have really done something when a piece like this is written. When we all met in May of 2006 and started talking about what this HS should be like, acceptance and diversity were at the forefront… as we were all coming from different backgrounds to start a new school. Im glad that in at least one students experience we succeeded..